The blog that Phil built in June 2005 has already taken its place among the Anti-Emergent Favs such as EmergentNo and Slice of Laodicia. Phil, in case you were wondering, is not happy about the direction of the emerging church as he sees it. Whether or not you appreciate Phil’s slant on the emerging church, his blog is an excellent example of color, fonts, readability, custom images, good links and focused content. Even with 50 million blogs, you can still make a big splash with a brand new, fit and virile blog. It is worth taking one software program, even an old lame one like Paint Shop Pro, and sticking with it long enough to master it. Humor and satire can grease the way for some good conversation. More advice: Phillip says “Copyright and trademark law do not necessarily apply to the use of images for caricature, farce, or parody” and he is probably correct, coming from a background with Moody Press. “1. Vintage artwork published without notice prior to 1978 is not protected under copyright law. As for me and my house, I have been using Fireworks since 2000, and i am happy with most of what i see in the emerging church. 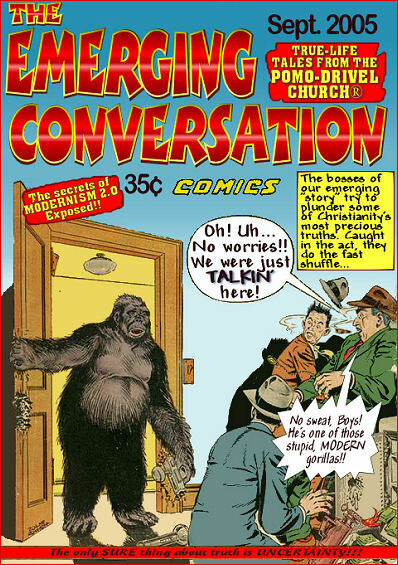 But then i have a more liberal interpretation of “emerging church” than Phil. In fact, since my definition includes the cyberchurch, Phil is probably part of it .. . although he would not like me saying that. Maybe it’s in the eye of the beholder…I read his site through RSS and don’t really like the graphics when I visit. Then again I didn’t think Jordon’s minty green site was too bad so what do I know. Thanks for the link. I like his design; simple, but with good graphics. The trademark stuff was helpful, too. Thanks for featuring my blog. ugh- i know this is important but speaking with the anti emergent people is so frustrating. they are like a parent that is always barking about what the child should wear or who they should hang out with but refuses to have relationship without fear. I know i am new to this conversation. My stomach just turns when i feel the spirit that the anti emergent people are coming in. Does anyone else feel this way? I guess the positive in all of this is it makes me want to see greater leadership coming forth in our communities.It seems like these people only see the few that are out there speaking. And i am sorry but that does not represent us effectively. Lord Jesus call up your leaders from within the ranks of the emergent. Make us strong and help us to see you more clearly.